How I came to plan a familiarization trip to Scotland was kind of strange. It all happened when Janice Armstrong, my friend from the Greece trip, referred her housekeeper Fiona Batson to me. You see, Fiona had been carrying around a lot of guilt about the disappearance of her brother, Duncan. ​He had disappeared thirty-nine years earlier in Peebles Scotland and Fiona felt she could only bring closure for her family by going back to Peebles to search for the clues leading to his disappearance. Janice told Fiona that since I had helped to thwart an international art theft ring, which included the recovery of a golden statue of Hera, and saving Janice’s life—I’d be perfect to help Fiona in her quest to find out what happened to her brother. Of course, I was hesitant at first. What if I let my friend down? But having an excuse to travel to the land of Braveheart and Rob Roy, to visit Edinburgh and surrounding cities in order to increase my knowledge of the area, gave me the extra incentive I needed. We arrived in Edinburgh and while sightseeing, an odd thing happened. We were secretly followed by Fiona’s first cousin. After sorting that out, we made our way to Peebles, where we learned that the city was getting ready to host the nationally acclaimed Beltane Festival. Little did we know that while searching for clues to Duncan’s disappearance, we’d be drawn into a cold-case mystery that would lead to murder and that during our investigation we’d be put off by the local police, and rebuffed with claims of second-sight and Cailleach’s Curse by Duncan’s old girlfriend, now married to Duncan’s best friend. Even more curious—why were we so warmly welcomed into the home of Craig MacIntyre, owner of the Peebles Woolen Mill and the last person to see Duncan alive? Just read, Celtic Curse, to learn all about how we solved the mystery of Duncan’s disappearance. "Dingwall, takes the reader on an invigorating journey throughout a provincial area of Scotland. She breathes life into the tale not only through the travails of her characters but in the observation of the minutest details of daily life in the region. She recounts historical features of the areas characters frequently making you feel as if you are there marveling at the architectural wonders the locale affords. You feel as though you can taste the Shepherd’s Pie and sticky toffee pudding. You feel yourself dab the froth of ale from the corner of your mouth with an embroidered linen napkin. You luxuriate in the softness of tartan scarves died in the various plaids of Scottish clans as they glide silkily through your open fingers. About Celtic Curse, the second travel mystery in the series: Fiona Batson shares with employer Janice Armstrong her compelling need to return to her childhood home in Peebles, Scotland. Thirty-nine years earlier, her eighteen-year-old brother, Duncan, vanished, and Fiona can only bring closure by searching for clues to Duncan’s disappearance. Janice refers the fifty-five year old housekeeper to Yvonne Suarez, a travel agent who thwarted an international art theft ring, recovered the golden statue of Hera, and saved Janice’s life a year earlier on a trip to Greece. Yvonne has always wanted to travel to the land of Braveheart and Rob Roy. 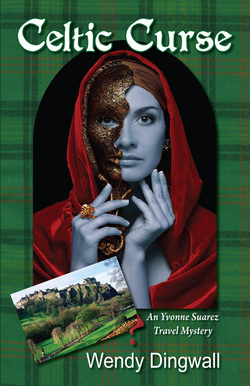 After hearing Fiona’s tale of her missing brother, she decides to accompany Fiona on her quest and plans a familiarization trip to Edinburgh and surrounding cities.While Yvonne is busy learning about Edinburgh, home of the world famous Edinburgh Tattoo, and Peebles, host of the nationally acclaimed Beltane festival--she and Fiona are drawn into a cold-case investigation that soon leads to murder.